We’re currently in beautiful Koh Samui, Thailand, which you’ll know if you follow our Instagram page. If you don’t, welcome! Follow us! We’ll show you pictures. Every single blog post we read about the island of Koh Samui says that it couldn’t be easier to get around…but here’s a bombshell…that’s just not true. We’re finding it very difficult to get around. Taxi’s vary wildly in price, the bus system is at the mercy of the driver and somehow there are never any buses when we need one (on a side note this morning a tourist did a runner and we ended up footing the bill for her bus journey – thanks lady!). Every other tourist is riding a moped. This doesn’t seem wise, the statistics on road fatalities in Thailand, and specifically Koh Samui, are very concerning. Neither of us have ever ridden a moped. Why start on a busy road without a lesson? So, as regular cyclists, we thought we’d hire bicycles. We have cycled in many different cities and countries. As a treat, considering the heat and hills, we decided on electric bikes. Ah, you may be thinking, here is wisdom. 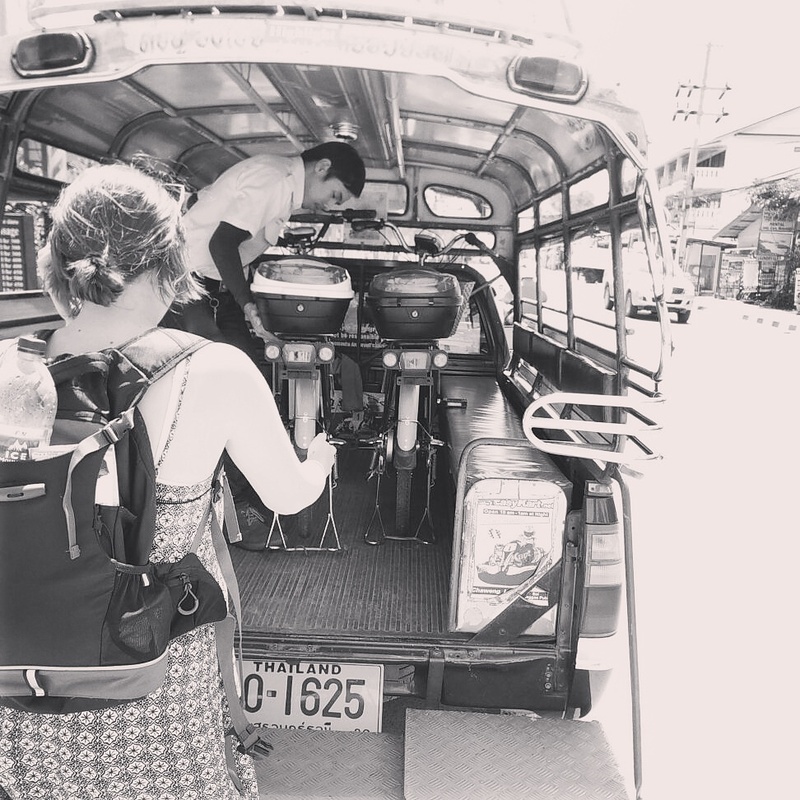 Rachel and Daniel know about road statistics in Thailand, they stick to push bikes. I’d hold that thought, if I were you. We set off at 11am – our first error. Why decide to cycle in midday sunshine? The motors on the bikes were amazing, making cycling up hills a dream. The bikes themselves were incredibly heavy and had no gears, but the motor made up for that. Actually it was a little like riding a small moped, but one we both trusted. Let’s fast forward ten happy but hot kilometers. All we wanted to do yesterday was visit the Hin Ya and Hin Tai rocks. We didn’t reach them because I went over a bump and my bike just broke down. There we were, miles from the hire shop, in the midday sun. The bikes were so heavy that I knew I couldn’t cycle back alone – especially up hills without gears. The first thing we found was a repair shop. Well, a motorcycle repair shop. The chap there was so helpful, but didn’t know anything about electric bikes which is fair enough. We called the rental place but they couldn’t understand us. We wished we could speak Thai. Taxi’s sped past and tourists and locals stared at us, possibly wondering what sort of people choose to cycle in midday heat. We had no options. We had to cycle back. Daniel, who is, as I’ve mentioned before, the steady rock in stressful situations, gave me his bike and took the broken one. After two kilometers of hills, we began another descent. Daniel stopped suddenly. We stared down the steep hill, watching cars and mopeds jostle for space. It wasn’t possible. The sun was steadily growing stronger and my skin began to tingle. We decided that we would just have to try and flag someone down – to walk the rest of the way in such heat would definitely result in illness. After a while, a bus came by. It was empty – we were so grateful for this – and we explained the situation to the driver. He charged us extra but we didn’t care. We would have paid anything at that point. Long story short, I’m burnt to a crisp and we’re thinking that mopeds might not be a terrible idea after all. Got any tips on travelling around Koh Samui? Let us know! Next Post Koh Samui – The Good, The Bad, and the Ugly.